It’s hard to believe that it’s almost March because this winter is just never-ending! The few days of “warm” weather last week (warm compared to the endless days of below zero temps!) was a nice reprieve, but then of course we got dumped on with almost another foot of snow and it’s back to cold temperatures. I’m so thankful I have a job that supports working from home on occasion, and also for the technology available that allows us to do so. It was so nice avoiding the messy roads last Friday and working in my sweatpants from my couch. I hope you were able to do the same – or at least I hope you didn’t have to travel too far. On days like those when I’d rather stay indoors, I tend to get creative with meals (unless I just recently went grocery shopping and have a stocked fridge). I look to my pantry and try to come up with dinner ideas using just the ingredients I have. For example, I took all the leftover vegetables I had in the fridge, threw them in the crock pot with some chicken broth, a can of diced tomatoes and a can of black beans, and created a great veggie soup. 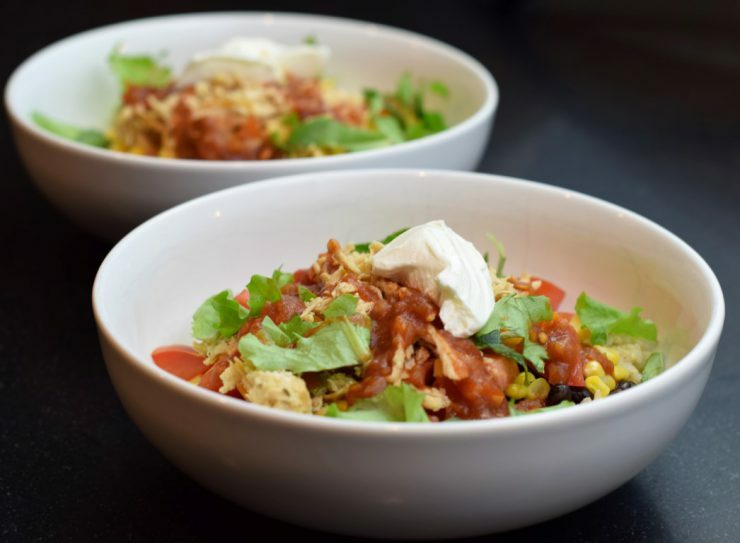 Another idea I came up with was homemade Chipotle-style burrito bowls, using ingredients I just had on hand in my pantry and fridge. The nice thing about this recipe is you can customize it and add or subtract ingredients based on what you have, just like you can at the restaurant. 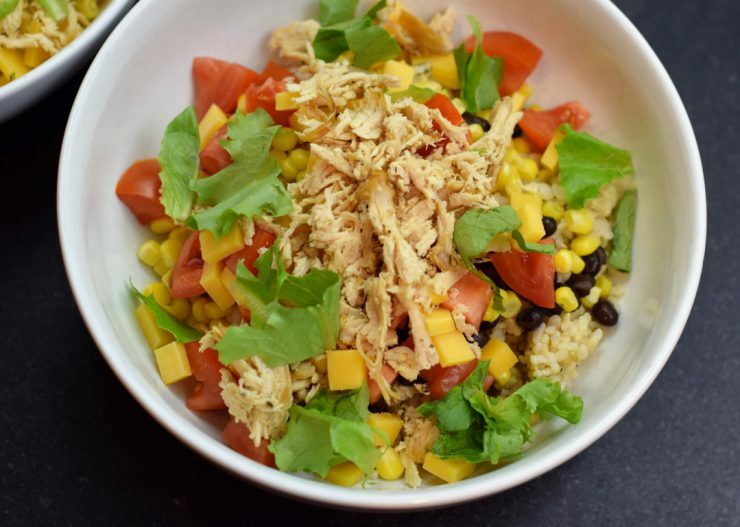 If you prefer burritos over burrito bowls, assemble all of our ingredients in a tortilla and turn it into a burrito. Whichever way your prefer, they are very easy to make and they even keep well in the fridge as leftovers. I oftentimes make up a large batch and eat these for lunches throughout the week. The first thing you need to do is cook the rice. You can use brown or white, whatever you prefer; I’ve actually even used quinoa in this recipe and it was just as delicious. 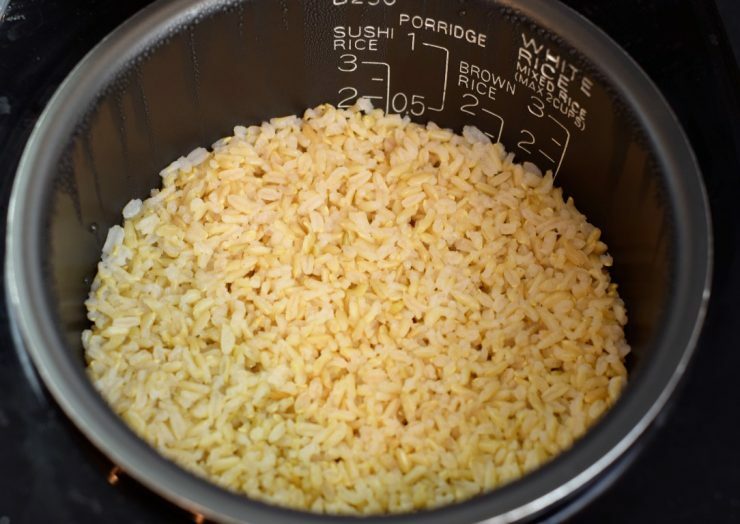 I love using my rice cooker, but if you don’t own one, check out Summer Tomato’s tip on cooking and freezing rice. Once you have cooked rice, I like to season it a little with salt and pepper, and sometimes I add in lime juice and cilantro. 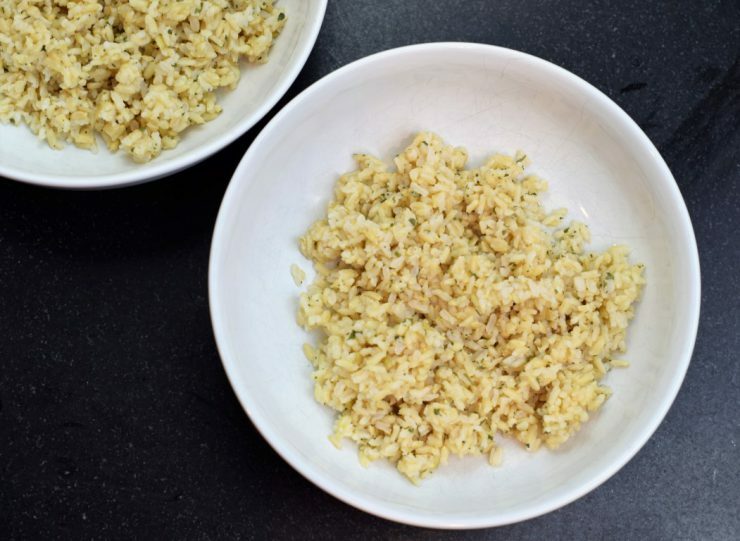 Add the rice it to your bowls. Open up a can of black beans, rinse and drain them, then spoon some on top of your rice. You can also use dried black beans if you prefer, but just note you’ll need to cook them ahead of time and have them ready to go. That’s next on my list of things to tackle, but for now I am using canned beans. We received an abundance of sweet corn in our CSA last summer; even after giving many ears away, I still had more than I knew what to do with. I decided to blanch the ears of corn, remove the corn from the cobs, and freeze it. It’s been great to use in meals throughout the winter and I knew it would be great in these bowls. Next, I diced up a tomato and an avocado I had on hand and added them to the mix. I also had a chicken breast in the freezer so I grilled it, shredded it (using my KitchenAid mixer paddle attachment), and added it to each bowl. 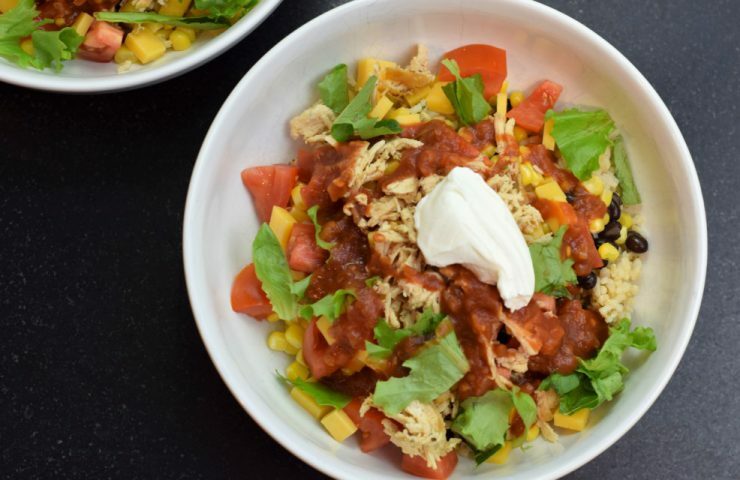 I topped the bowls with freshly shredded cheese, sour cream and salsa. If you’re making up a larger batch and want leftovers, I’d wait and add these ingredients right before serving. 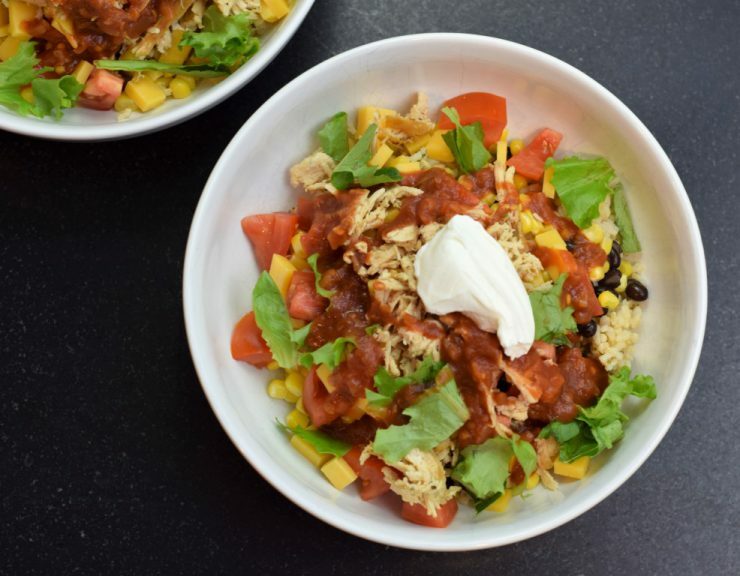 As I mentioned before, these burrito bowls are very customizable. Maybe you want to add in steak or shrimp instead of chicken or saute onions, peppers, and summer squash and make it a vegetable burrito bowl. 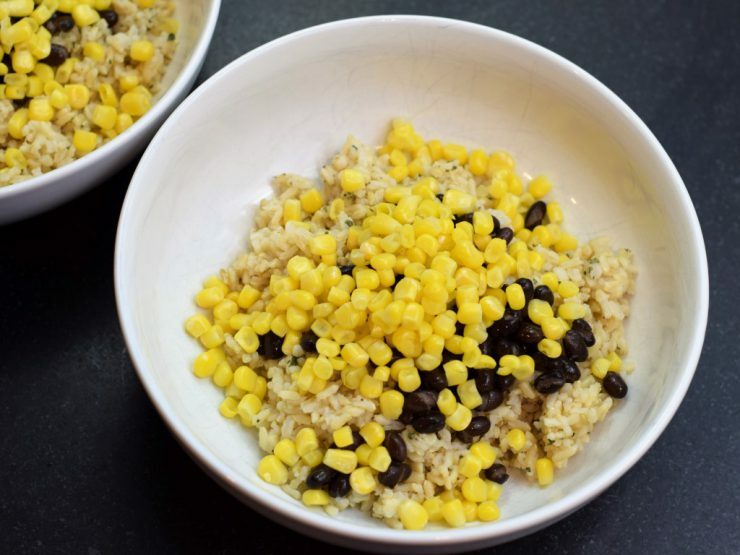 Try using quinoa instead of rice or swap red beans for black beans. Add in some homemade salsa or guacamole if you have some on hand. The best part about this dish is it really lets you get creative and have fun! I hope you enjoy these as much as I do!